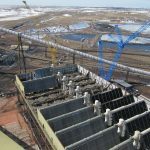 This project consisted of the relocation of a combined cycle power plant (550 Mega-Watt) from Mississippi to New Mexico. 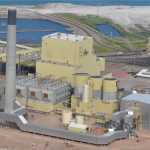 The relocation included complete dismantling, relocation and re-erection of two Aalborg (CMI EPTI) heat recovery steam generators (HRSG) along with associated pipe racks and other equipment to include retrofit re-installation. In addition to the HRSG relocation was the relocation and re-erection of 3 complete Stellar chiller packages. Each of these packages contained two compressors and a 4-cell Wet Sac type cooling towers with related piping installation. LPR’s scope also included the erection of a new turbine generator building consisting of 13,500 tons of new steel, the installation of the bridge crane to service the turbine deck and complete erection of a new SPX 35-Cell ACC (Air-Cooled Condenser) along with all air ejector equipment and process piping.